The Svengali deck was created more then 100 years ago to create amazing magical illusions with cards. The basic trick performed with the Svengali deck works like this, the magician takes the deck and shows that all of the cards are different. A spectator then selects a card and magically all of the cards become the selected card. We carry both a book and DVD that will teach you many of the tricks that can be performed with this deck. 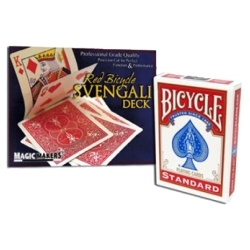 The Svengali deck is available with traditional Bicycle backs in blue or red.